After Grenfell Tower, news that displaced residents will be rehoused in “Posh New £5m Flats” (Star) at a new-build complex called Kensington Row located around a mile and a half from the disaster. The development has 68 flats, where the three-bed and four-bed flats are worth “around £5m” each. These bigger flats, says the paper, are where “a majority of the survivors” will live. Over in the Express there’s news that only “some of the victims” will be rehoused in the new flats. I’d say none of the victims will be. They’re dead – at least 79 of them. It’s the survivors who are being rehoused because their last home was a toxic time-bomb. The flats, secured by the City of London Corporation, are worth even more in the Express. Now homes on the plot are worth up to £8.5m. Residents have access to a “gym, swimming pool, spa, private cinema and 24-hour concierge”. Are we supposed to envy them, or just marvel at the insane London property market which keeps so many people off the property ladder? And then we learn that the City of London Corp paid around £10m (source: The Sun) for the 68 flats. That’s not £5m each is it – even if Diane Abbott is doing the maths. The majority of survivors are not living in £5m flats. It’s just under £150,000 for each, on average. Yes, I know that’s not the asking price, but the base price. The developers have “sold the properties at cost price”. But it proves that the flats’ monetary value is affected by many forces, not least of all guesswork and the legal requirement that all new complexes contain an element of low-cost housing. The government defines affordable housing as “social rented, affordable rented and intermediate housing provided to specified eligible households whose needs are not met by the market”. The need for a decent roof over your head is not a luxury or an investor’s punt. It’s a basic human requirement. 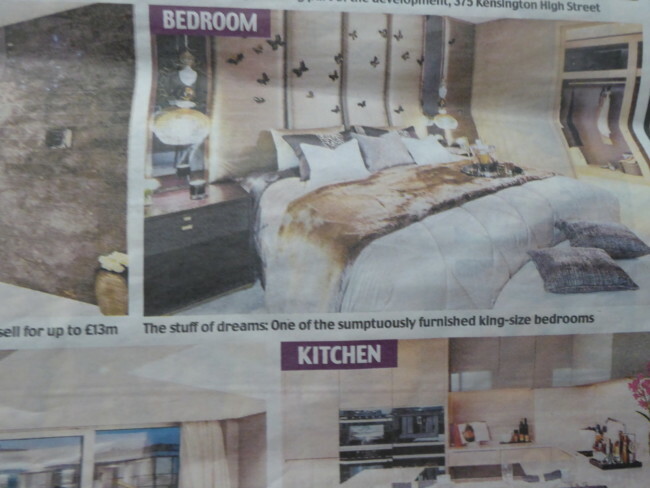 Oddly, the Mirror makes no mention of the new flats until Page 5. Buried in the 14h paragraph of a story on how Grenfell Tower became enveloped in a “deadly cyanide cloud”, we learn that “some Grenfell residents” will be rehoused “in a £10m deal”. The Mail leaves it to pages 20 and 21 to focus on the flats. Now the flats are in “£2bn blocks” and worth up to £13m. The flats are “the stuff of dreams”. Well, the privately owned ones next door the council flats on the same £2bn development are. The council homes will have a lower spec. 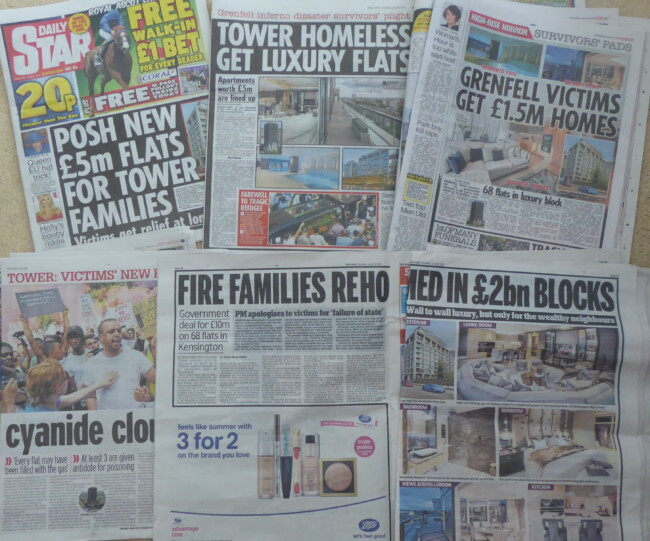 The rehoused Grenfeell Tower survivors will, the paper observes, “live near multi-millionaires”. Not everyone’s a multi-millionaire in London – yet. There are people in the city who live in social housing and do menial and blue collar jobs. Who knew?